The Syrian Uprising: Part II, "The Military Reality on the Ground"
Just to make sure I'm adequately managing expectations: the military situation on the ground in Syria is very fuzzy, and is made up of very contradictory reports of government supporters and Free Syrian Army supporters. We'll do what we can. What we do know is that the Free Syrian Army is now capable of occasionally holding serious bits of territory. The Syrian Army recently took back a big chunk of Damascus suburbs, and the rebels seem to have taken a suburb of Homs. It's still tough to figure out the current size of the FSA. The Army itself says their fighters are above 40,000--and with the amount of trouble they're causing over increasingly large areas simultaneously, this may be right. But it's hard to tell. And if they do have 40,000, they won't all be armed. Many will be in support and logistics roles, coordinating ambush-style attacks. But we know that the FSA is capable of hitting and destroying Syrian tanks (which are mostly sitting ducks in city streets against insurgencies), attacking major bases (like airfields), and even setting up roadblocks in areas near Damascus. But keep in mind: the Iraqi insurgency, which was far larger, better-funded, and better-armed, failed against the US-led coalition and the burgeoning Iraqi military. That said, the Syrian army is not equivalent of the US army, but the will to remain is incredible. Like the Ghaddafi regime, the Assad regime is very unlikely to willingly go until near the end. Assad is very likely less delusional than Ghaddafi, and will therefore call it quits before death, but a prolonged insurgency won't be enough to cause him to voluntarily leave. In short: the rebel opposition, made up mostly of the Free Syrian Army, is vast, increasingly organized, and has a safe haven in Turkey. It has serious staying power... as long as it is funded (the Syrian army has coffers to pay their soldiers; the FSA does not). We will see many continued months of insurgent attacks against the Syrian army, likely attempting to convince rank-and-file soldiers or even entire companies to defect. The Assad regime does not have total control on the ground, and this should be a matter of serious concern for the regime. More to come on what this means with respect to the FSA's prospects for victory, but it'll have to wait until next time. 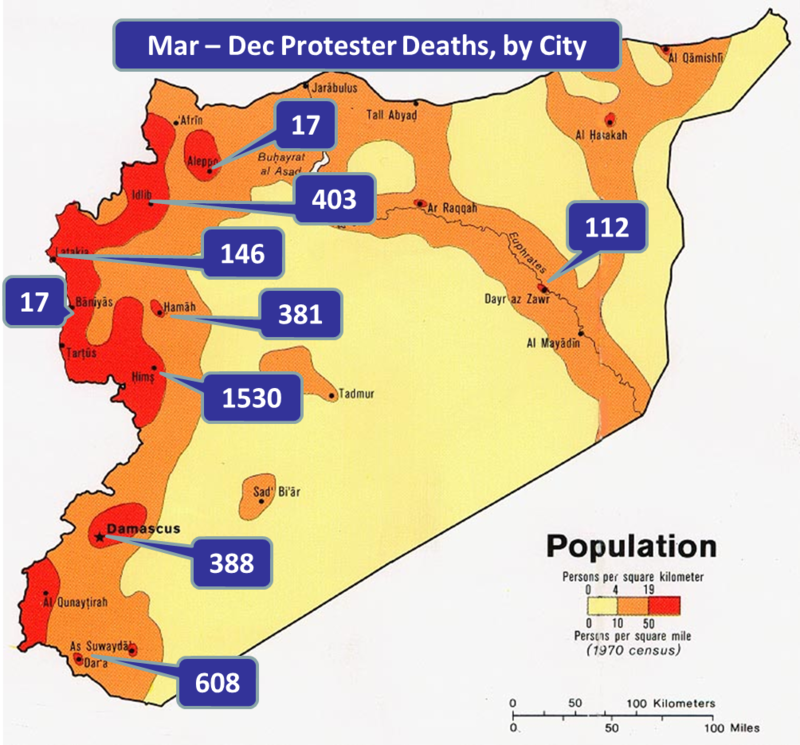 The Syrian Uprising: Part I, "The Nature of the Opposition Movement"
Syria is not Egypt, is not Tunisia, is not Libya, is not Iraq, is not Afghanistan. Getting a sense of the nature of the uprising will require a relatively detailed analysis that requires us to more-or-less throw out any preconceived model we have based on these previous uprisings. Let's take a look. 1) The nature of the opposition movement. 2) The military reality on the ground. 3) Prospects for opposition victory. 4) Options for foreign powers and the directions the conflict could go. Today, we're discussing: 1) The nature of the opposition movement. Libya's opposition was largely regional: the east and west were largely separated by vast desert, and had developed very separate identities. Bahrains was largely religious (Shiites dominated by Sunnis). Afghanistan's is ethnic (mostly Pashtuns). Iraq's was both ethnic and religious (Sunni Arabs dominated Shiite Arabs and Sunni Kurds). Of course, the above descriptions are grossly oversimplified (Tripoli had major protests until they were quashed, for example), but give us an idea of where the base of power of the opposition movements come from. The opposition movement in Syria appears to be primarily Sunni in nature (which is interesting in that Sunnis are the largest ethnic group in the country and the largest group represented by the government), and regionally diverse. 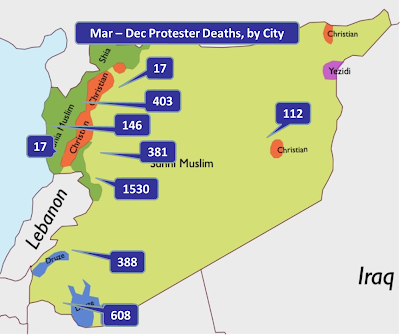 If we use protester deaths as a proxy for the intensity of the opposition activity in Syria, we can see below that we have intense protests in all of Syria's major geographical areas, and that they do not focus on a particular religious area. 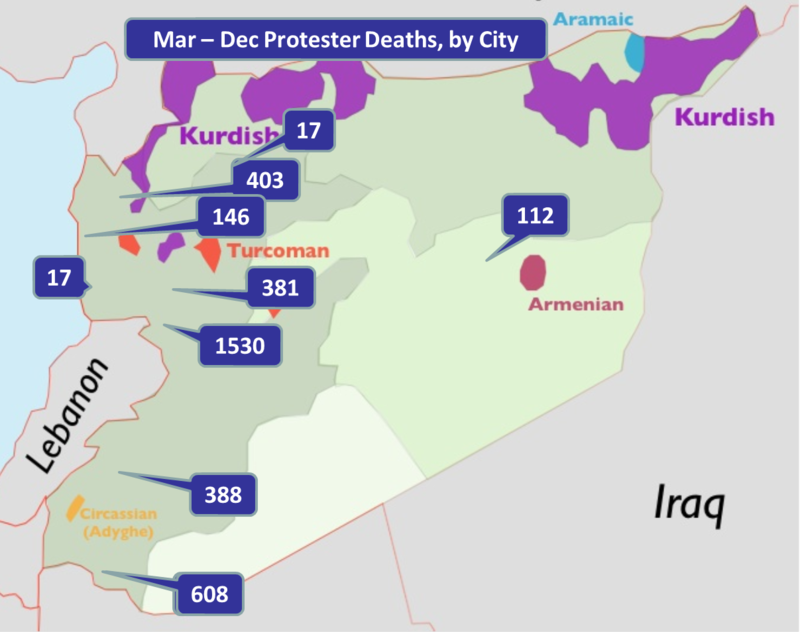 Interestingly, we also don't see significant unrest in areas of Kurdish majority, which has been the case in neighboring Iraq & Turkey (although the Kurds are demanding greater rights & protection under the government). There are scattered reports that the protesters have an anti-minority bend, particularly against Christians and Alawites. The opposition is, in turn, accusing the Assad government of inciting religious violence. It's not clear how much sectarian violence is actually happening, and how much of it (that is happening) is government-caused. The demographic diversity of the movement helps us understand the nature of its political aims. The opposition, beyond calling for Assad to step down, is apparently seeking wider democratic reforms and civil rights. This has, of course, been the banner of the opposition movements in other countries, though the opposition groups do seem to be keeping in line with their original ideas so far. The question for The West will be: is this an opposition that wants a liberal democracy, or one that wants a more Islamist democracy? The former will tend to be more Western-friendly, and the latter tends to be more at odds with US allies like Saudi Arabia, Kuwait, and Israel. It'll be tough to say--the Muslim Brotherhood definitely has a strong showing in the area, but in Syria, many other faces make up the various oppositions, and all sorts of strange alliances might arise (and, to be fair, the Muslim Brotherhood is relatively moderate). So, to some extent, there is a wait-and-see on the political reality of this opposition movement, just as there has been in previous revolutions across the Middle East. But before we think about it too hard, we need to get a good sense of the military reality on the ground in Syria, which we'll discuss next time.